It is only 30 days until we leave for our European adventure. Our Triumph Trophy 1200 is patiently waiting for us in its stable at Stefan Knopf’s place in Heidelberg, Germany. These last few months of anticipation are almost over, but have been spent thinking of this blogs title, Do Good as You Go. 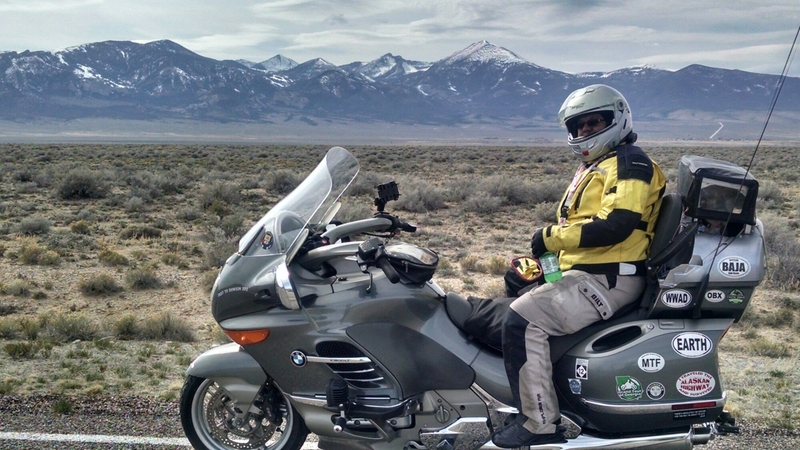 My entire professional career in healthcare has been spent taking care of people and many of my long distance motorcycle rides have been for children’s charities. As my riding has changed from point A – point B riding, to a more relaxed, slow down and live the adventure type of touring, I want, No, I have a need to help in a different way beside just raising funds, which I will also continue to do. 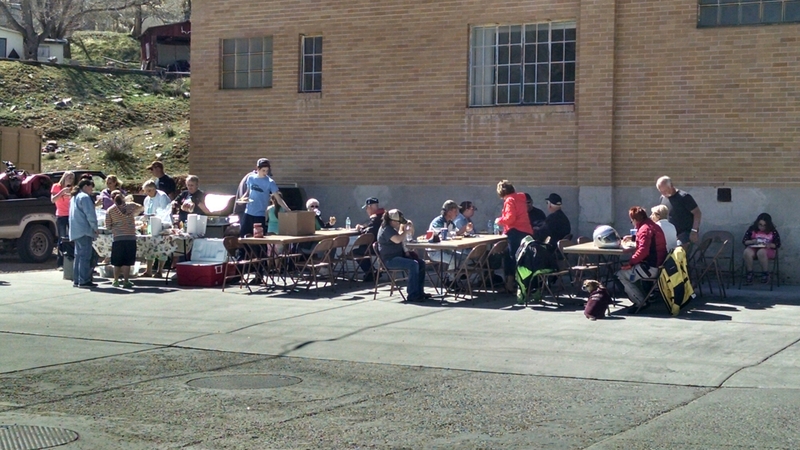 This past of couple of years we were introduced to a group of Round The World (RTW) travelers starting with Lisa and Simon Thomas, 2 Ride The World, and Benka Pulko at a BMW national rally to more recently meeting Ted Simon and many more amazing people at the Overland Expo 2014 meet in Arizona. Becoming involved with Horizons Unlimited, which is a motorcycle overlanding group, and reading the inspiring written words of Ted Simon’s “Jupiter’s Travels”, and Sam Manicom’s adventure series of books, his first being “Into Africa”, has inspired us to travel with a purpose. Joining the Ted Simon Foundation as a supporter, we now follow the adventures of several incredible people and friends traveling the world and telling of their journey. 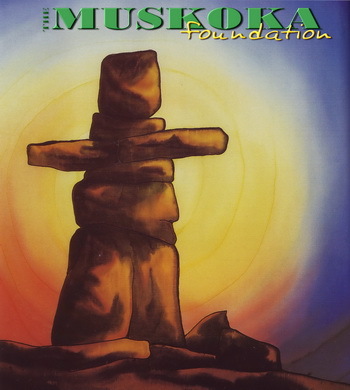 Several months ago we learned of The Muskoka Foundation which has as their moto, Do Good as You Go. Instead of riding thru areas or countries just to arrive, slow down, meet people, stay, learn and contribute in some way. To travel, submersing one’s self into the different cultures, that is to experience. As we circle back to our upcoming journey of Western Europe we will try to slow down and experience instead of just being a tourist. This will be new to us as most “vacations” in our hurry up American culture are spent rushing and seeing things. We will be setting up a fund raising site to raise money for the Muskoka Foundation. As we learn and continue hopefully other journeys will be spent helping and Doing Good as We Go. If you like following our blog and what you read of the Muskoka Foundation, which is also the official charity of Horizons Unlimited, Yosemite 2015, give a few dollars either directly to them or thru Go Fund Me, in which all money collected will go to the Muskoka Foundation. We hope you continue to enjoy our adventures. Those words bring to mind gambling, lights of the strip, beautiful people and partying. But, within a short ride in all directions, easily done in two days, are fantastic memorable rides that you won’t soon forget. 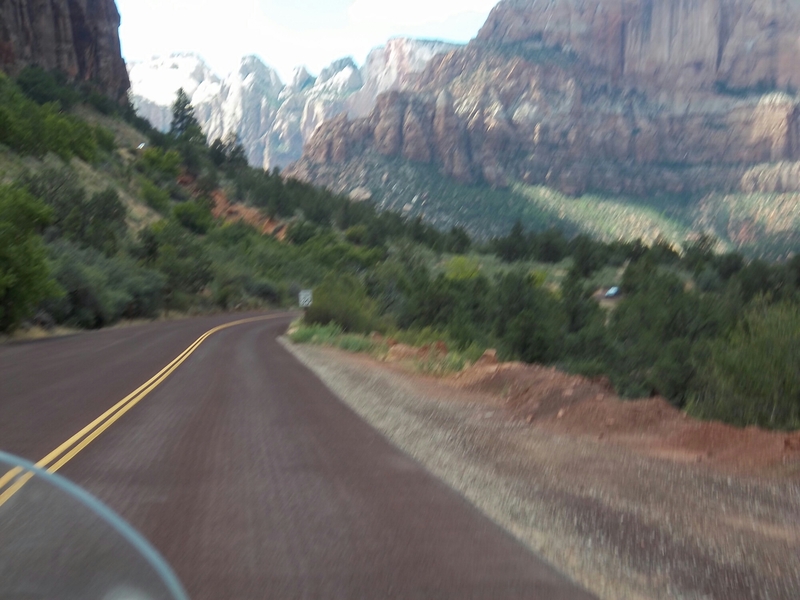 Since I had a weekend off call, we decided to ride north and visit a couple of our favorite National Parks. 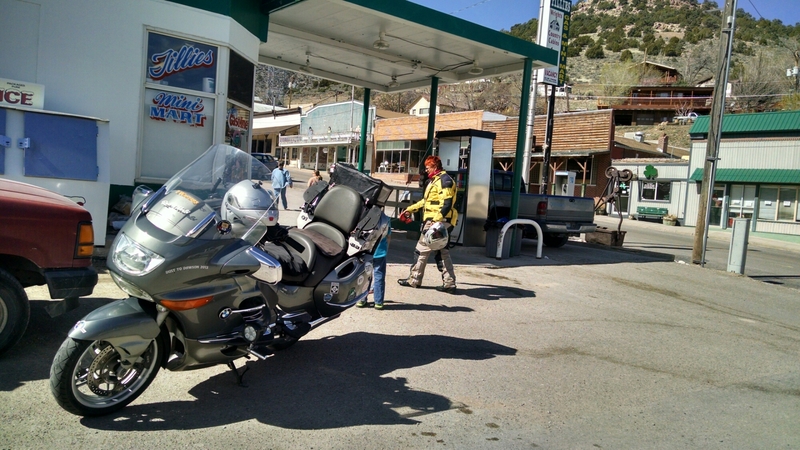 Loading up Saturday morning, our Two Up with a Pup gang set off on the BMW K12LT with its newly rebuilt final drive for our first stop, the Cathedral Gorge State Park. 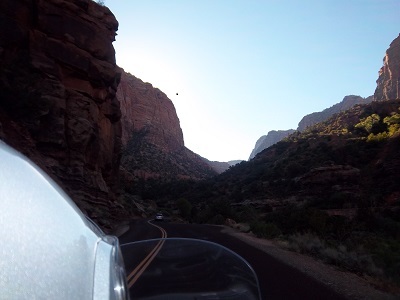 Turning off of Interstate 15, we headed north on the first Nevada scenic byway, US 93, aka the Great Basin Highway. 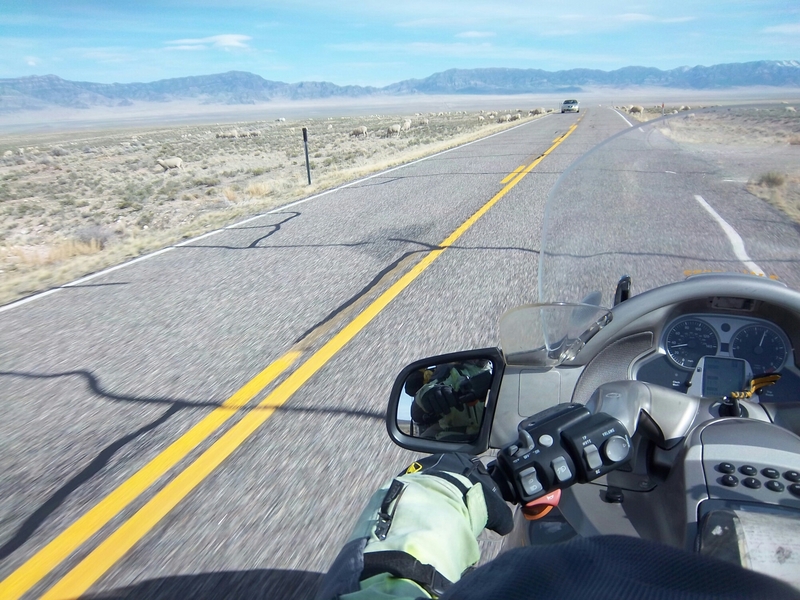 This scenic byway, at 135 miles long, passes through 10 ghost towns, 5 State Parks and and 1 National Park, the Great Basin National Park, on its way to Ely, NV. 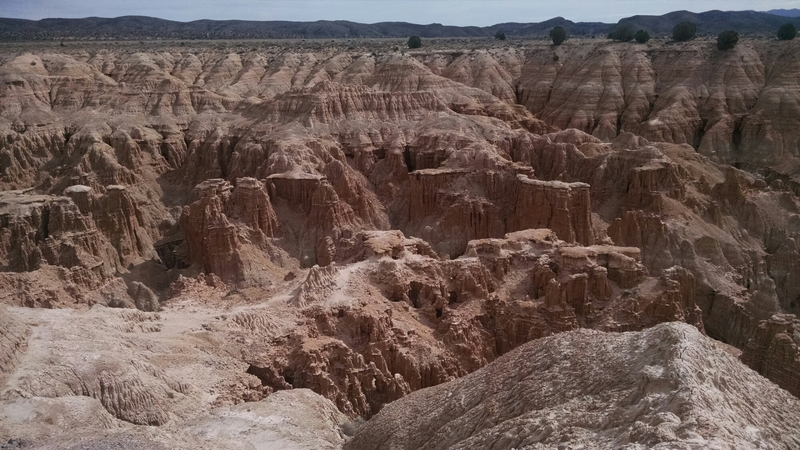 Cathedral Gorge is the result of volcanic activity, ash deposits and time. Erosion has carved dramatic and unique patterns in the soft bentonite clay. Trails abound for exploring the cave-like formations and cathedral-like spires. Miller Point, a scenic overlook just north of the park entrance on U.S. 93, offers excellent views of the scenic canyon. 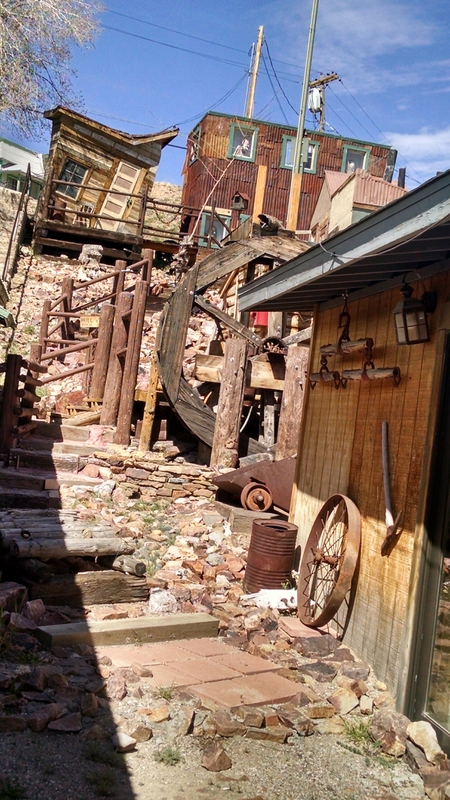 About 10 miles up the road is the old silver mining town of Pioche. 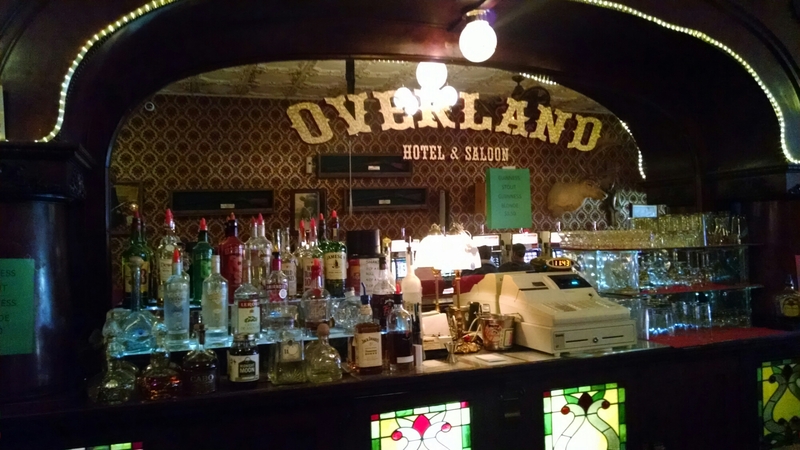 From 1870-1877 over $20 million dollars of silver ore was hauled by wagon out of this town. With crime running rampant and guns being the law, legend has it that violent death accounted for the first 72 graves in Boot Hill before the first citizen of Pioche died of natural causes. Now that the mines have shut down the main interest is tourism. We stopped for gas at Tootsies and were invited to the 28th anniversary of the establishment featuring a cookout in the parking lot with some of the interesting local citizens. 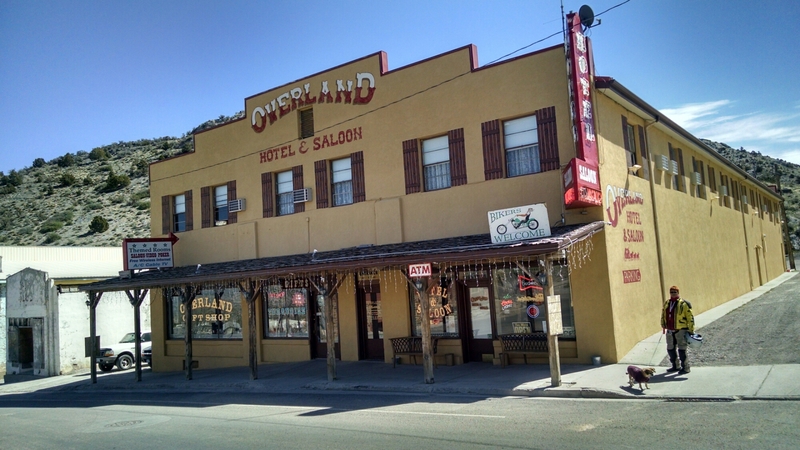 Down the street a block was the Overland Hotel, in business since the early 1900’s. The past 17 years have been spent restoring it back to its former glory. 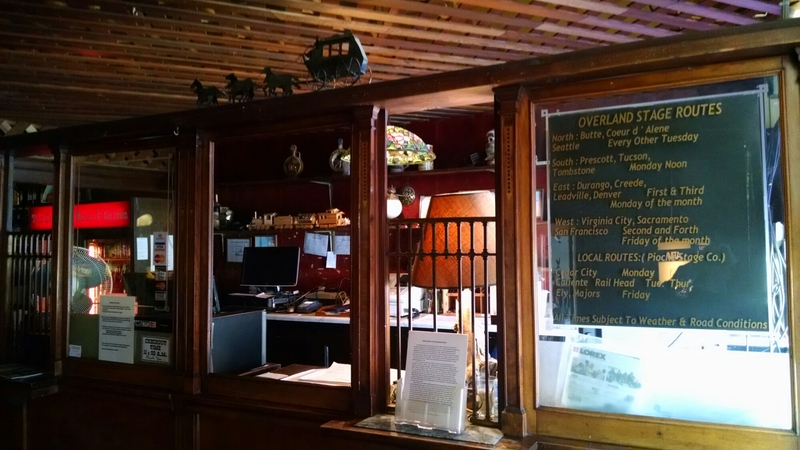 Check out the old bankers cage, bar and dance hall before walking up the stairs to see the rooms, redone with modern conveniences, while keeping the old charm of the hotel. Since we were running a little behind on time we rode north to the intersection of US 50, the Loneliest Road in America, known for its desolation running across Nevada to Reno. We turned east headed to Utah and the Great Basin National Park. Skirting the park we admired the scenery and the snow-covered peaks of the mountains in the park. Turning south on UT 21 we headed toward Beaver, UT, trying to beat the darkness as the sun sank ever so slowly toward the mountain peaks at our backs. We hit one traffic jam miles from anything, slowing us and luckily the large truck that caught up with us. Morning brought with it brilliantly clear blue sky and 27 degrees. Gear and heat on, and Gypsy covered in the back, we crossed the mountains and jumped on US 89, riding south toward one of our favorite National Parks, Zion NP, in southwestern Utah. 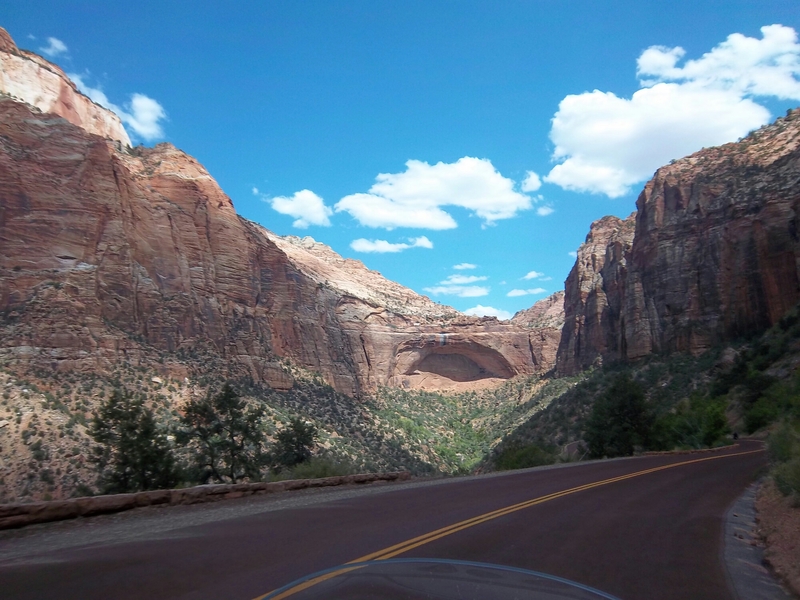 We turned west on Highway 9 at Mt Carmel toward Zion and took our time riding through the park, enjoying the brilliant shades of red colors and rock formations that make up this incredibly scenic park. 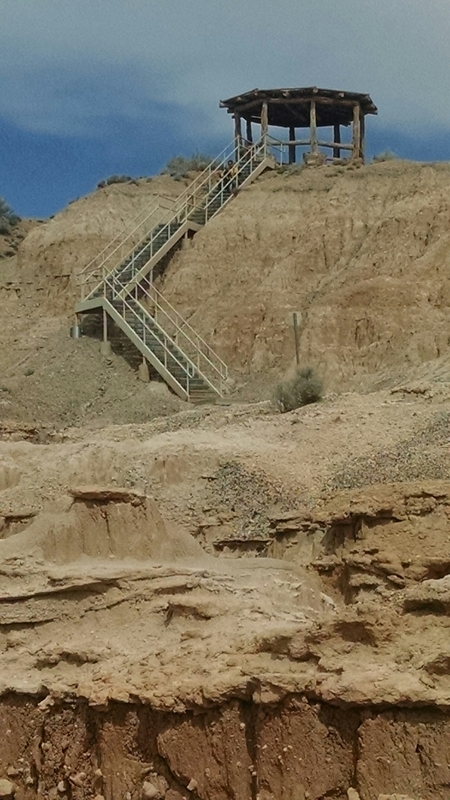 You can’t ride up into the park but you can take a shuttle to the far end where at low water times of the year you can hike the slot canyons. We hopped on the interstate for the 2 hour ride back to Las Vegas. The interstate that runs through the canyon heading back to Las Vegas follows the Virgin river through the NW corner of Arizona. 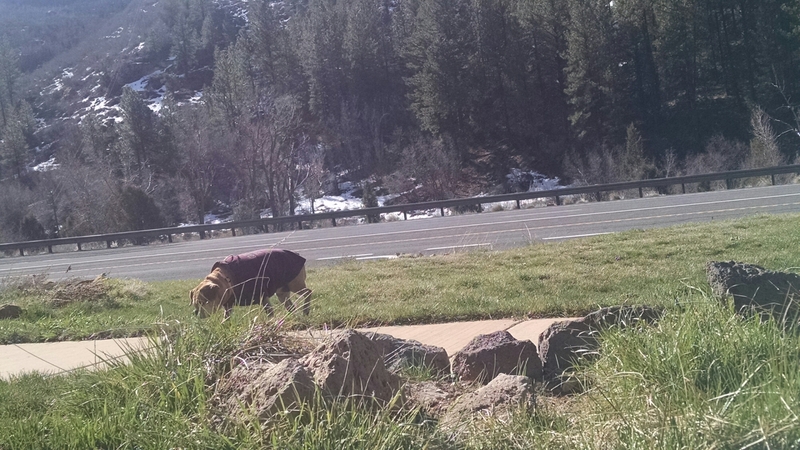 Several months ago during heavy rains the interstate heading northbound was completely washed out. Construction is extensive and is still underway as bridges were also gone. We made it back as the day was heating up and settled in the pool to cool off with an adult beverage. It was a great weekend.